"The deaths of one million menhaden in North Carolina's Pamlico Sound in 1991, 150 endangered Florida manatees in 1996, and 400 California sea lions along the central California coast in 1998 have all been attributed to harmful algal blooms (McKay and Mulvaney 2001). They disrupt aquaculture, wild fisheries, and coastal tourism. In the past two decades, their effects have expanded from a few scattered coastal areas to nearly all coastal states (Burke et al. 2000)." Algal blooms occur in both saltwater and freshwater environments and cause harm through two primary mechanisms. The first category of impacts is the production of toxins. 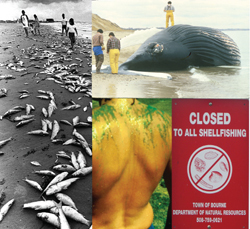 Toxins may kill fish or shellfish directly, or may cause one of several human illnesses following ingestion of contaminated seafood. The second category of impacts is high biomass accumulation, which, in turn, leads to environmental damage or degradation. These effects can include light attenuation, clogging of fish gills, or depletion of dissolved oxygen upon decay of the algal cells. Some HABs can even kill fish because of their physical shape, lodging in gill tissues and causing a physiological response leading to death. The coastal ocean is suffering from overload of nutrients.